Health officials aren't recommending people have their breast implants removed after the Canadian government released its safety review on cases of implant-associated anaplastic large cell lymphoma (BIA-ALCL). A Health Canada safety review has found a low number of cases of a rare cancer associated with breast implants. The federal department conducted the review after cases of breast implant-associated anaplastic large cell lymphoma (BIA-ALCL) were reported internationally, a news release issued Friday said. The cancer is not breast cancer and does not occur in the breast tissue. It is a "rare type of non-Hodgkin lymphoma (a cancer that affects the immune system) that may develop many months or years following a breast implant procedure," says the release, and usually appears as "seroma" fluid between the implant and the tissue that surrounds it. It's not known what causes BIA-ALCL and it has occurred with both saline-filled and silicone gel-filled breast implants, Health Canada says. However, the incidence is low, the department said, with five confirmed cases reported by Canadian manufacturers in the last decade — or one case per 77,190 implants sold. It's possible there are more cases that weren't reported to manufacturers or Health Canada. Breast implants have either a "textured" or "smooth" surface. Four of the five cases of anaplastic large cell lymphoma reported in Canada involved textured surface implants. According to the U.S. Food and Drug Administration website, "most data suggest that BIA-ALCL occurs more frequently following implantation of breast implants with textured surfaces rather than those with smooth surfaces." Textured surface implants make up one quarter of all breast implants sold in Canada, according to Health Canada. 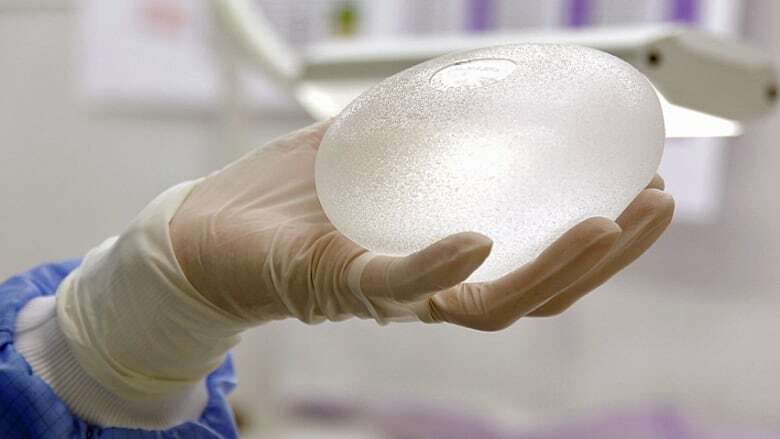 The department says it is not recommending that women with breast implants have them removed. However, women should consult a health-care professional if they experience breast pain, sudden swelling or a lump. Health Canada also recommends that women with breast implants conduct regular self-exams and see their surgeons for "periodic follow up." The FDA also does not recommend implant removal unless women are experiencing such symptoms or an abnormality in their breasts. Because of the safety review's findings, Health Canada "is working with manufacturers to update the safety information on the product labelling for all breast implants," and will continue to monitor the safety of implants, including watching for cases of breast implant-associated large cell lymphoma. Women thinking about getting breast implants should talk with a health-care professional about the risks and benefits, Health Canada says.